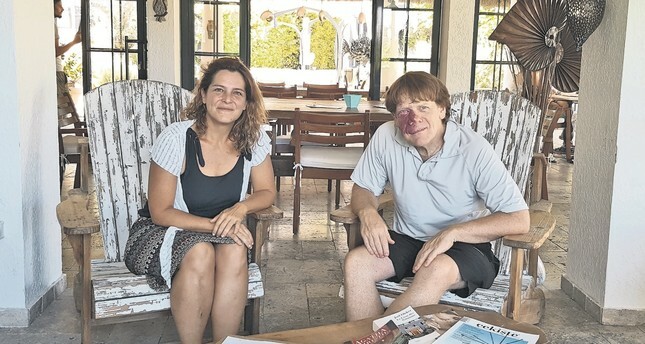 Daily Sabah’s Leyla Yvonne Ergil interviews saxophonist Ed Pithey. If you haven't heard of Evrencan Gündüz, a young and rising musician taking Turkey by storm, then you are in for a treat. This 22-year-old singer-guitarist from Turkey has been performing bluesy renditions of favorite cover songs, as well as original material from his two albums, on YouTube and at concerts all over the country with his musical outfit "Uzaylılar." Joining him on this journey from the very beginning, in which Evrencan Gündüz went from street musician to Turkey's rising new star, has been Ed Pithey, a saxophonist from California. I first heard of Evrencan Gündüz, who is the son of Turkey's legendary rock and blues guitarist Asım Can Gündüz, a.k.a the late "Awesome John," when friends showed me videos of the young guitarist and vocalist joined by saxophonist Ed Pithey on a rooftop overlooking Istanbul performing mesmerizing versions of songs such as What a Wonderful Word, Sunny and Take me to Church. It was not only thrilling to witness a young Turkish musician taking on these jazz pop songs with such eloquence, but the covers he performed were arguably more touching than the originals themselves. Since then, Evrencan Gündüz and Uzaylılar have gone on to record two EP albums of original music and have played on stages all over the country. You can catch them almost weekly in Bodrum and Çeşme as well as performing in Antalya this summer. Saxophonist Ed Pithey is a California native who has become as iconic as Evrencan's sideman in a number of videos as well as in onstage performances. I had the fortunate opportunity to meet up with Pithey prior to a show in Bodrum. Asking Ed how he first came across Evrencan Gündüz, he told me that as a travelling musician he was in Turkey three years' back when he saw "Evren," as he calls him, performing on the street with his dog in Moda. Drawn in by his voice and style and the fact that it was evident he was really enjoying what he was doing, is what compelled Ed to join the young guitarist-vocalist on saxophone. Together they began making videos and continued playing on the street, albeit not for much longer because soon they began booking regular gigs with shows every night, which Ed adds, were almost always full. But Evrencan's start truly came from his pop-up performances, in which he would perform for passers-by in squares and parks around Moda as well as to entertain passengers on ferry rides. "He loves playing on the street,"Ed tells me adding that despite his popularity, he still continues to hold pop-up performances by letting his fans know through social media that he will be performing in 30 minutes at a specific location, such as in the heart of Moda in front of Ali Usta Ice Cream shop or on the grassy seaside. It seems Evrencan loves being spontaneous and loves the element of surprise. One time when Ed joined in on one of Evrencan's adventures, he found himself on the top of the Pera Hotel roof, performing songs as seven to eight cameras recorded what would become a video series on YouTube that contributed greatly to Evrencan Gündüz's popularity. Ed said, "I had no idea exactly what we were doing or which songs we would be performing. It was not something we had practiced and only some of the songs had been played by us before." Nonetheless, the outcome is captivating as Evrencan's up-and-coming talent and Ed's expertise on the saxophone is evident. Ed Pithey studied music at the University of Redlands, and performed in 34 countries as a travelling musician before settling in Turkey, where he taught guitar and music theory for an international school in Istanbul. He is also a songwriter, singer and guitarist and has written a number of his own songs, one of which he plans to record with Evrencan.As for "Evren," as Ed and almost everyone close to the musicians refers to him as, Evrencan Gündüz ve Uzaylılar have now released two EPs, the five-song self-titled Evrencan ve Uzaylılar, which was released last year and their six-song latest, titled "Mevsim Çiçekleri." As for Evrencan Gündüz's love for spontaneity there is never a set playlist, Ed tells me, adding "we discuss what to start with and just go from there." "One of the things that has been so satisfying and rewarding playing with Evren is that he and I think so much alike in terms of music and we understand each other so well; that is one of the things I like and enjoy so much," said Ed adding, "Even though he is just a 22-year-old, I guess you could call him an old soul". I asked Ed if he was ever recognized on the streets here in Turkey and he said, "Yes, all the time. However, I wish I spoke Turkish better because it would be nicer for those people who want to say something and sometimes they are not able to. But it is a nearly daily experience now." This summer Evrencan Gündüz ve Uzaylılar will be performing at a number of popular holiday destinations such as Paradiso in Alaçatı this Sunday, July 15 . On Wednesday, July 18, they take the stage at Savra Bodrum, where guests can enjoy a gourmet meal and a more intimate concert experience. On Sunday, July 22, Gündüz ve Uzaylılar return to Paradiso in Alaçatı and on Wednesday, July 25 they will be in Antalya's Sponge Pub. Their schedule will continue with Wednesdays in Bodrum and Sunday's in Alaçatı followed by an opening performance for the one-time front man for the group Oasis, Liam Gallagher at Istanbul Blue Night which will take place at Küçükçiftlik Park on August 14.